Toqua's Crafts: Do you doodle? When I was younger I used to doodle ALL THE TIME. Life happened and I don't doodle nearly as often as I used to. Awhile back I found myself doodling while I was watching TV. Do you see that black line? That is what I started out with! (It was red to start, I just made it black so you could see.) I then added the the red around it. What do you see? Curly hair? Waves? It looks like an angel and trees! Or what do you see? I'm a scribbler, not quite a doodler. Followed a linnk to your blog and I'm enjoying looking at your projects and posts! 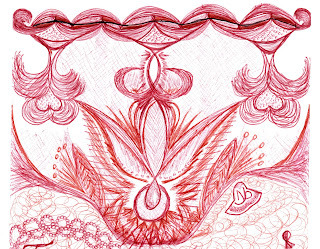 I'm a big time doodler and when after meetings that I'm subjected too...errr...contribute too...everyone wants to see my latest creation. 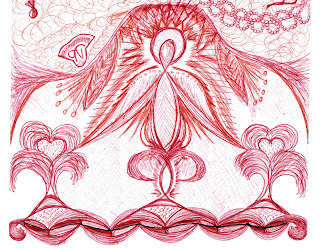 Usually they tend to be toward the abstract and floral flourish end of the doodle spectrum. At first it looked like you were drawing mustaches! !